I've just finished teaching the first semester of my new course "Making Money in Genealogy" at SLCC and I want to tell you about the two genealogy courses I teach for the genealogy program at Salt Lake Community College. They keep me fresh and focused on the needs of genealogists as I get to work with wonderful students. The program teaches you to become an excellent genealogist and are all taught entirely online. In fact the entire SLCC program is academically rigorous and you can receive college credit while you are sharpening your family history skills. Now is the time to sign up for summer term if you are interested. I'd love to have you join us. I've been teaching GEN 1000 "Computer & Internet Tools for Genealogy" for 6 years now and I think it is a fantastic way for anyone to bring their genealogy technology skills up to date. Kelly Summers and I wrote it together and we came up with a program that works for beginners as well as seasoned genealogists who just need to brush up on their tech skills. After learning about basic genealogy research and documentation standards and how to enter your research into genealogy software, students use census and vital records to carefully document their own lives, their parents and their grandparents. There are lessons about picture tagging and restoration, oral interviews, and internet publishing and sharing, and then the midterm project is just to take 6 hours to do something that needs to be done in your family along those lines. After learning about continuing education opportunities and watching a webinar, and then surveying software and mobile apps, the final project is simply to turn in the three generation research compiled into software generated reports with complete documentation. Grades are based on methodology, not the amount of research completed. Most genealogists I know haven't taken the time to completely document the first three generations of their family and by the time the student is finished, they are ready to move forward with excellent technology and documentation skills. Then, the new course I've just developed is GEN 1014, "Making Money in Genealogy." This is the course I wish I had had 12 years ago when we started Family ChartMasters. I've poured all of the things I've learned into this course to save the students all the learning curve I've had to overcome. We survey genealogy opportunities and the structure of running your own business and then the second half of the course is all about marketing (something all genealogists can improve on.) By the end of the course you have written a complete business plan, begun branding, and interviewed a professional genealogist. 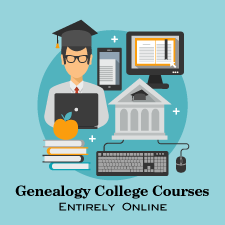 I think the course has everything students need to get started on the right track to becoming a successful genealogy professional. You can take either course for credit or as an audit and seniors who live in Utah can take each course for only $10. The entire genealogy program at SLCC is an excellent curriculum that unfortunately is not very well known in the national genealogy community. Hopefully that will change soon. The program is designed to prepare students for credentialing with ICAPGEN or BCG and has fantastic instructors. There are 13 courses and you can complete enough in one year to obtain a certificate of completion. I've really enjoyed working with Kelly, Karen Clifford, and Sharon DeBartolo Carmack. They are excellent genealogists and wonderful people. I can highly recommend this program to anyone who is serious about becoming an excellent genealogist.